If you are involved in a SAP HANA system conversion project and take care of the custom code (see also the blog SAP S/4HANA System Conversion – Custom code adaptation process) at a time you will reach the point, where you will need to do functional adaptation for your custom code on your brand new SAP S/4HANA system. 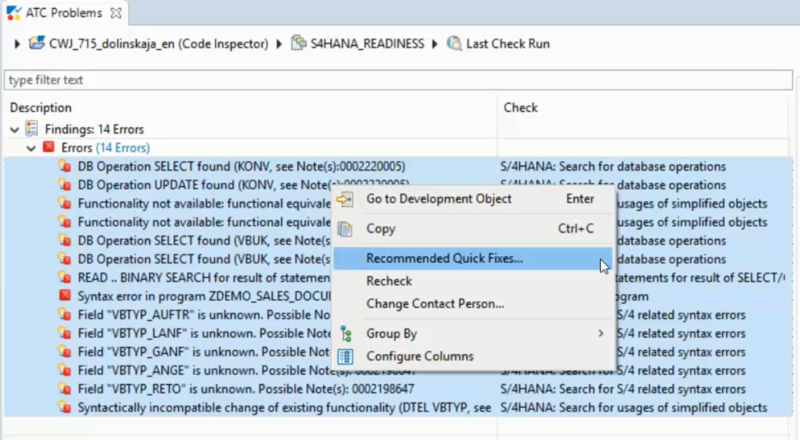 For this purpose, you will run ABAP Test Cockpit with the S4HANA_READINESS check variant on your SAP S/4HANA system and will get a long list of ATC findings which you need to fix. No doubt, it as a substantial manual effort to look at every ATC finding and adjust your custom code. Besides this, often the most ATC findings are the SAP S/4HANA standard known issues, which could be fixed quickly without dipping into source code analysis, reading SAP Notes for adaptation guidance and so on. 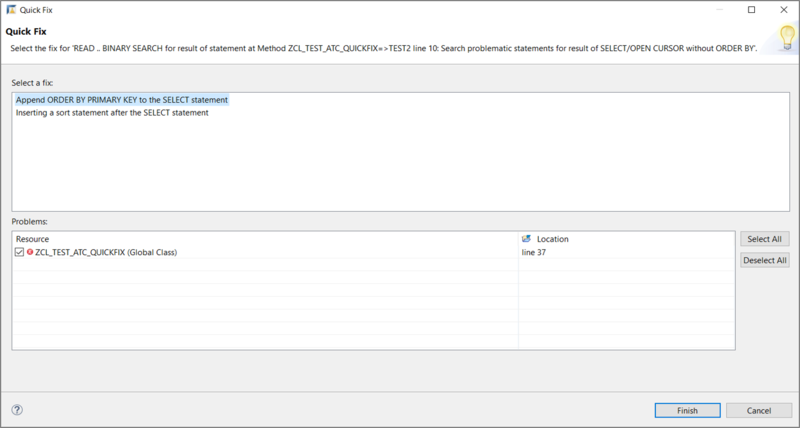 One of the typical functional adaptation use cases during SAP HANA migration is the missing ORDER BY clause in SELECTs before the READ statement. According to the SQL specification, you can not rely on the sort order in SELECT without ORDER BY. This can lead to unexpected behavior when the database is changed (for example to SAP HANA) because the results return in a different order without ORDER BY. When you check your ABAP code containing such issues with ABAP Test Cockpit in ABAP Development Tools (ADT), you will most probably get a long list of ATC findings in your ATC Problems View at READ.. BINARY SEARCH statements, which were caused by the missing ORDER BY clauses in the previous SELECTs. Now you can correct such issues automatically via ADT Quick Fixes. There are two possibilities for applying Quick Fixes. Recommendation: If there is more than one Quick Fix available for an ATC finding, we recommend to select the first Quick Fix displayed. Alternatively, you can jump to the affected source code line by double clicking the corresponding ATC finding and choose Quick Fix in the context menu (or Ctrl + 1 shortcut). Double-click the Quick Fix in the popup to apply it to the affected source code line. That’s it. You can save and activate your source code and rerun ATC. Further Quick Fixes for the most prominent SAP S/4HANA simplification use cases which are suitable for automatic adaptations are available with the SAP Note 2738251. These Quick Fixes are applicable for accesses to database tables VBFA, VBUK, VBUP, KONV, BSEG and usage of VBTYPE data elements in source code. 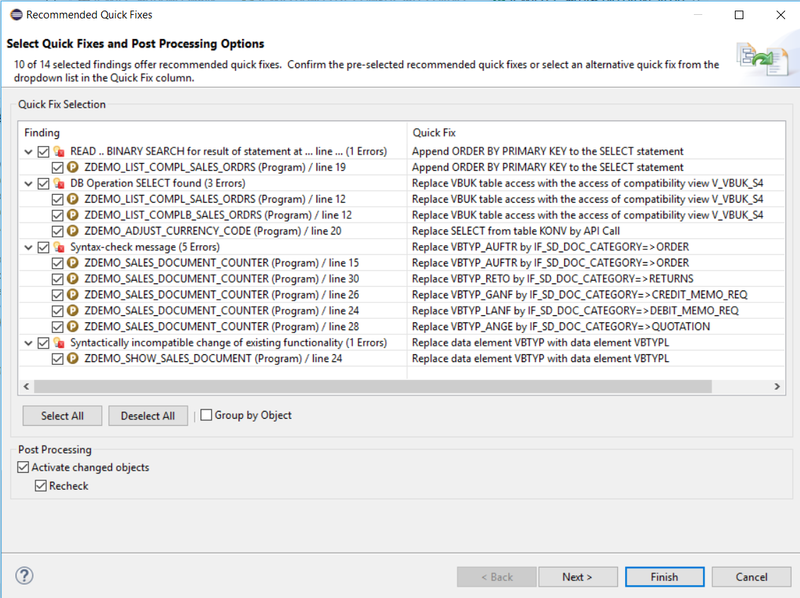 With the SAP Note 2364938 is also the QuickFix for MATNR available. Beyond this the mass-enabled Quick Fixes are now available with ABAP Development Tools 3.0 and ABAP Platform 1809 FPS01, which make it possible to adapt full packages or software components in one shot and in this way drastically reduce your custom code adaptation efforts. You can also get mass-enabled QuickFixes on SAP S/4HANA 1809 FPS00 by applying the SAP Note 2695592. If you press Finish button, you apply the Quick Fixes for all your selected ATC findings, for which the Quick Fixes are available, at one shot. This is not a HANA specific behaviour. As I’ve often had to point out on questions on the ABAP tag “my data isn’t being returned in the correct ord”, while observed behaviour might initially mislead you, there is no implicit sort order on relational databases. The order in which you get records back is simply undefined – whether you’re using Oracle, HANA or whatever. it is indeed so, that many implementations of SELECTs without ORDER BY relied on the presumable “sort order” in the underlying database. It was the motive of using SELECTs without an explicit sorting clause. The applications were programmed using the “expected” order in the result set returned by such SELECTs, and switching the DB vendor (SAP HANA is only the example) caused functional incorrectness. I agree with you, that actually DB vendors don’t sort data in tables, they rather implement the way, how the data is fetched by SELECTs on their DBMS, and it can vary from DB vendor to DB vendor. I changed the text in the blog so it will become more clear. It’s not really a question of vendor implementation – it’s a feature of relational databases by design. A programmer who relies on a mythical database sort order has written a broken program. Generally, records remain in the order they’re added. This is particularly visible with internal number ranges. However, a database reorgansiation can completely muck that up – especially if there have been deletions and insertions. I would like to suggest an improvement for this quick fix. You see, about 20 years ago, HASHED and SORTED tables were introduced into the ABAP language. Since then, BINARY SEARCH is rarely (if ever) required. Sadly, many programmers are firmly stuck in the last millenium and don’t use these “new” constructs. You can be sure that the Quick fix described in the blog is only the start of our roadmap. Besides the fixes for functional correctness after S/4HANA conversion we also have Quick fixes for security, performance and other code quality aspects in mind. And we also keep an eye on the modern ABAP and how we can get rid of the old ABAP stuff by using Quick fixes. I’m sure this blog will help to collect proposals from you ABAPers. I understand from the prerequisites the quick fixes can only be used once the conversion occured (ie backend is SAP S/4HANA 1809) although, if I am not wrong, these are the fixes which could be done on ERP as a pre-project activity. If I am right on both statement above, do you foresee a possibility to have those nice tools available with ERP as a backend so that code can be corrected before the SAP S/4HANA project starts? It’s a helpful feature for developers, hope to see such features, not only for conversion but for regular development of codes and looking forward to see more features in it. This information is very helpful.I tried to do the same in my system but I am not getting the ATC check option in eclipse. Currently I am using the eclipse IDE version. Can you please guide me which version of the eclipse we can use so that we can get the ATC check option along with this quick fix option ?. see “Prerequisites” chapter of this blog. Any update on the timeline for release of next set of quick fixes? see the updated “What’s New” section of the blog. thanks for providing the information about the QuickFixes, which is a very nice way how to deal with the custom code from my point of view. Some of the fixes are realated to a conversion to S/4HANA, and some are related to the conversion to SAP HANA (like e.g. the sort order problem). Is it planned, that the QuickFixes considering SAP HANA are also provided for older releases, like NetWeaver 7.40 or 7.50? no, there are no plans to downport QuickFixes to lower NetWeaver releases. Very informative and useful blog. I tried this option in 1809 FPS001, after adding notes system started bringing S4H related quick fixes as well. I have a question, I didnt complete remediation but lead till recommendations, will there be somekind of comments added to remediated code? Will there be a dashboard once we are done with quickfixing in mass for reporting? If not is there a way to identify which all objects are remediated by quickfix(not from transport request point of view). Information on ATC problem view is very feeble. From eclipse if we want to run on all custom packages, how can we do it? Should we ran ATC from GUI, then will result set be available from Eclipse for doing a mass Quick Fix? thank you for trying out the Quick Fixes and providing feedback. Regarding adding the comments to remediated code: such functionality in already in our development backlog. Regarding the dashboard for Quick Fixes and which objects are remediated: you get the preview and dashboard on Quick Fixes using the SAP Fiori App Custom Code Migration and by grouping the ATC findings by Quick Fix filter in the App. From ADT in Eclipse you can run ATC on several custom packages and then apply the Quick Fixes to the ATC findings in the ATC Problems View. We will also provide the central ATC check run result of the system in ADT, so that you will be able to execute mass Quick Fixes for this ATC result. This feature is also already in our development backlog.